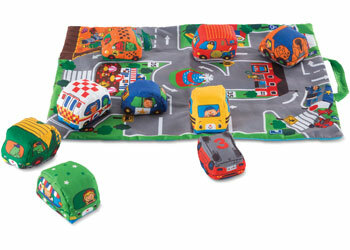 Take the fun along with you with this versatile, colourful play mat and vehicle set! 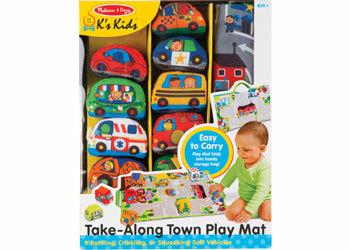 The mat, with a non-skid backing, features an illustrated town and road scene in bright, eye-catching colours. The nine soft fabric vehicles crinkle, rattle or squeak and also have numbers on the bases to encourage number recognition and early sequence skills. All fabrics are easy to clean. The play mat folds up to become a convenient storage bag for the vehicles, making it perfect for travel.